L'esperienza è emozionante però non si può mettere sulla mongolfiera 20 persone, si perde tutta la magia. Fatta in questo modo la ritengo troppo cara.L'autista e lo staff comunque hanno cercato di fare il loro meglio e sono ben organizzati. A fantastic trip, I loved it! Our first attempt didn't happen as there was bad weather i could see the lightning! but they gave us breakfast and blankets to sit in the huts while they decided if it was safe to go or not. I wasn't at all annoyed that we didn't get to go that day as safety is paramount. I was offered the next morning and went then instead. This is a well organised trip and definitely worth it. The views are breathtaking. Our pilot was brilliant. The landing was a light touch on the ground and that was it. No bumpy landing, nothing to be scared of at all. If you've never been in a hot air balloon then definitely go. This was my first time and I'm so glad I did it. the views, simply stunning! 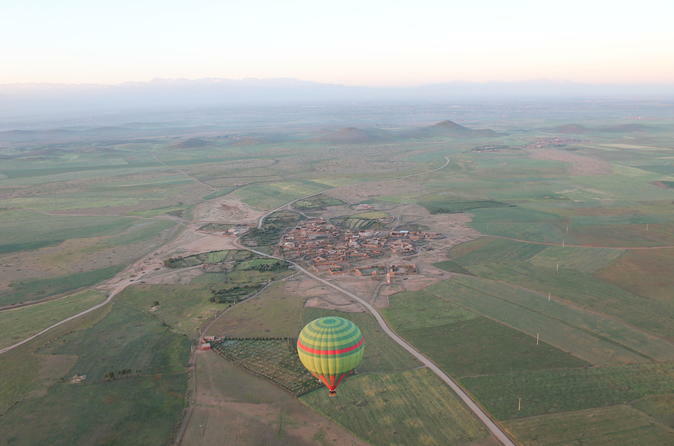 The impressive Mountains, rural farm land and local village houses could all be seen on our sunrise balloon experience! I was picked up at 6am and made it back just after 9, no problem for a second breakfast at my hotel! Disappointing as there was barely anything to see from up in the balloon. We were in the middle of nowhere and there was nothing to see. The breakfast afterwards was also disappointing and cold. Not worth the price at all. Magical trip - just do it! The gang of lads organising the flight were great fun, and the breakfast in a fantastic Berber desert tent was lovely. Absolutely amazing! Very well organized. Was picked up early from our resort and taken directly to the hot air balloon launch point. 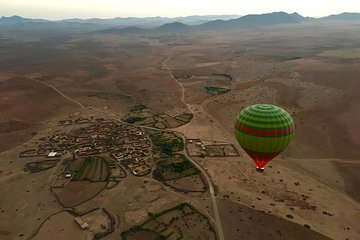 After a brief introduction over Moroccan tea, we watched our balloons inflate. Amazing photo opportunities. We got our own basket on the hot air balloon which makes it feel very private. After takeoff, they opened a bottle of champagne and we all enjoyed a glass over a remarkable sunrise. Very personable and felt private even with others on board. Our biggest highlight of our Moroccan trip. The ride is long enough to enjoy the sights, but not too long that you get bored. After landing, we had an amazing breakfast in a Moroccan tent. Highly recommend. Daniel, our tour guide was very informative and polite. Very fluent in English as well as French. He also took some amazing pictures of my wife and I with my camera. Be sure to bring your camera!